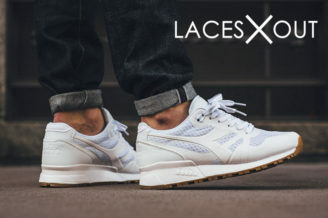 I fell in love with the N9000 when I saw the recent launch of the triple white / gum bottoms. 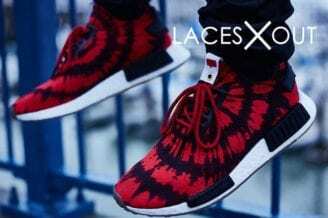 To be 100% honest, this was the first time the Italian sneaker brand really registered on my radar, so I started taking a deeper look at their inventory. The N.9000 boasts a wide range of clean colorways that are perfect for the upcoming summer season. This list contains the best N9000 colorways and release dates for you to track down and add to your collection. This rendition of the N.9000 silhouette features a white mesh toe with a contrasting black suede stripe running from front to back of the sneaker. The sneaker also features blue nylon (hence the “NYL” title) on the body of the shoe and red accents popping up on the sole and rubber toe box. The Poppy Red combines the refreshingly bright poppy red and Irish green under the premium quality upper made of pure suede and nylon. To bring in another color (much like a background for its bright neighbors), the toe has been kept white, giving the shoe a colorful appearance that can attract anything from passersby’s attention to honey bees. The Golden Straw is a happy mixture of golden straw and Bermuda green. 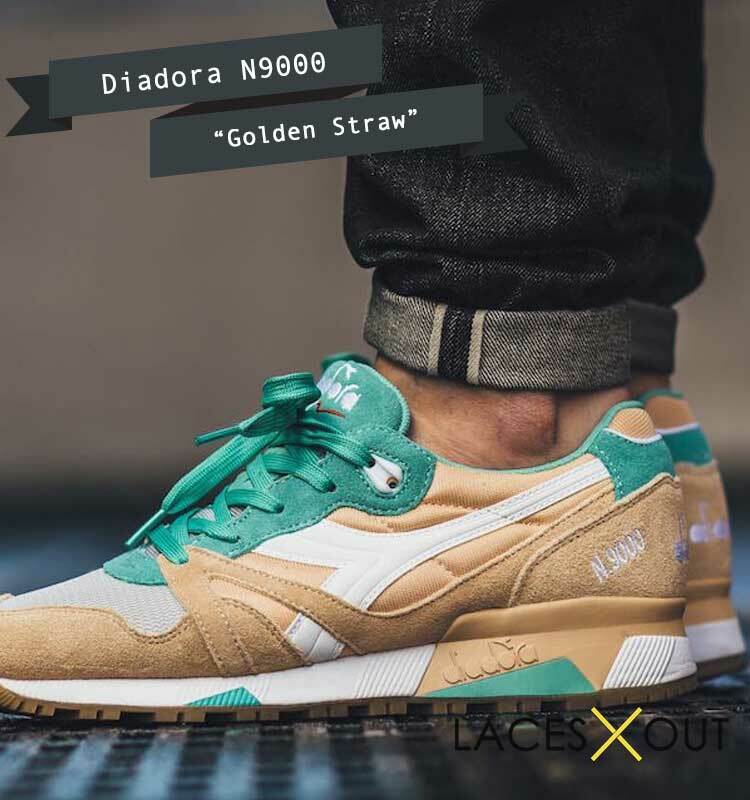 While golden straw makes up most of the shoe, serving as the background color, Bermuda green adorns the shoe in patches around the laces, on the back, and on the outsole. 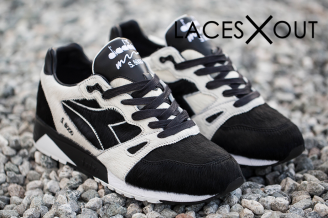 Streaks of white on the suede upper add a neat touch to the whole color scheme. 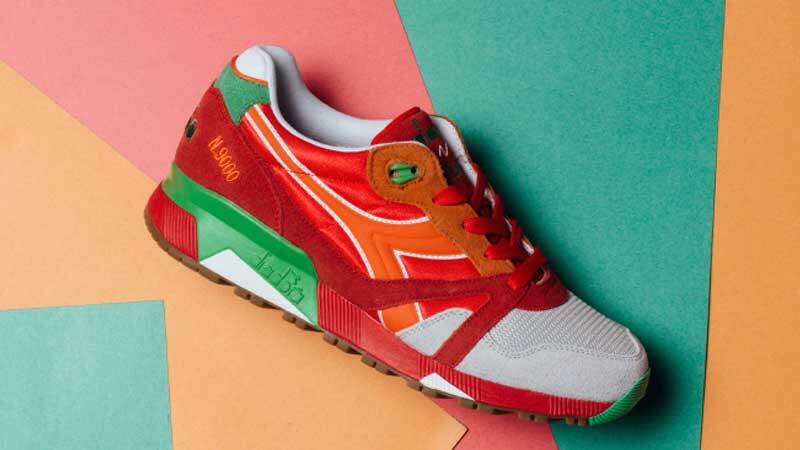 The Diadora N9000 La MJC was the product of a joint celebration by Diadora and La MJC to mark the latter’s ten years of bestselling print publications. Needless to say, the end product had to come out “classic”, so they mixed leather and perforated leather to give a durable, comfy outer and sprinkled purple here and there to complete the sense of that “classical”, “bookish” taste it was meant to reflect. The Silver Lake Blue can make no claim to be universally popular. Some would always find it garish, but it has a die-hard fan-base of its own. These are people who love shiny deep blue color with stripes of maroon, i.e. the Silver Lake itself. The added silver on the outsole adds further to the vivid color scheme. The Diadora N9000 Black Tie is nothing but class and a sense of taste that reflects the ability to dare and reach higher. 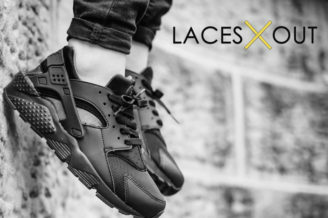 The black outer contrasted with white outsole and the tongue make the shoe noticeable from across a mile. 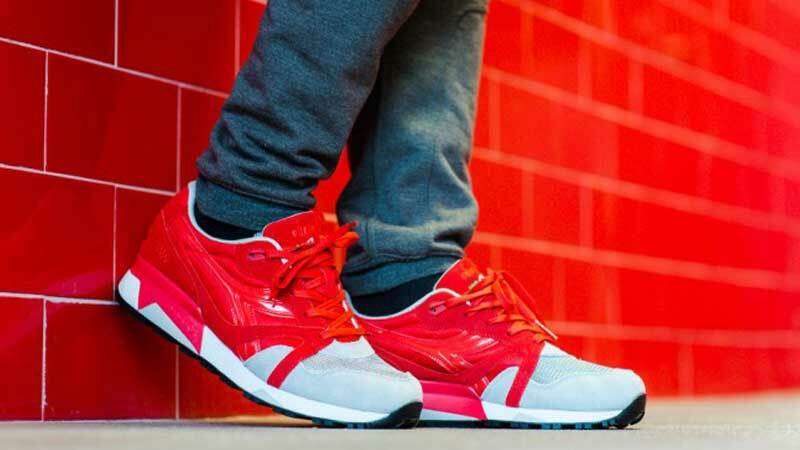 To make it all the more catchy, Diadora has sprinkled a little bit of red right next to the laces and silver on the outsole. 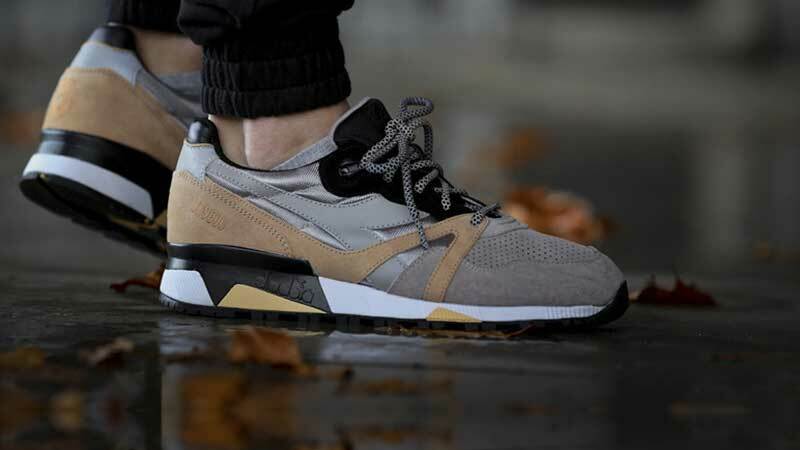 The Nottie Veneziane was the child born of Diadora’s mating with Bait, who were invited to come and design for the former a shoe that reflects the peak of the Italian sense of taste. They put together cow-leather and snake-skin to create an outer of cow leather embedded in snake-skin textured purple on a white outsole. Inspired by Italy’s old currency, Lira’s 500000 denomination, the shoe contrasts aquamarine and pink with shades of green and off-white on a beige outer. The rear quarter panel reads 500,000, reflecting the value of its inspiration, and the security stamp (like you see on notes) is embossed on the tongue, completing the touch of a currency note-inspired theme. 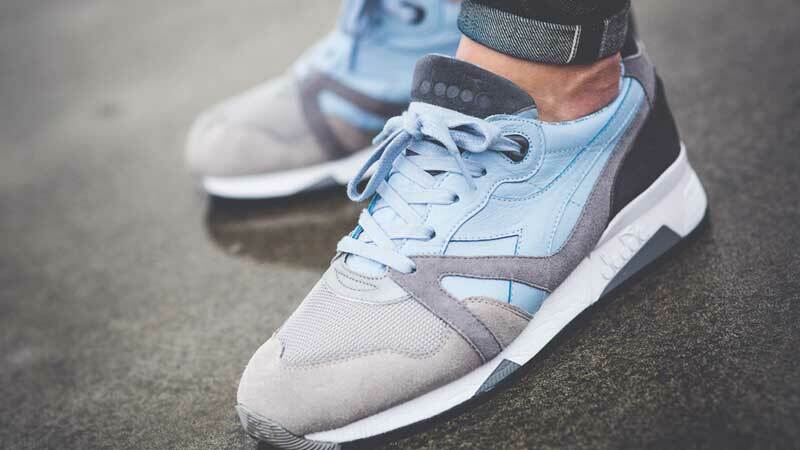 The NYL Blue/Grey has one of neatest color bifurcations in the Diadora N9000 series. Omitting the outsole, the entire back part of the shoe is electric blue, and the dull silver grey toe with visible black regions on the outsole make the three-color scheme blend flamboyantly well. Perfect for teenagers! The NYL red/grey is exactly the same as blue/grey with the only exception that the blue has been replaced by an equally bright, shiny, electric red. The silver and black regions remain the same, and so does the outsole color pattern. Like blue/grey, it’s perfect for teens and people with a lively taste for bright, shiny colors. Ever heard of Italy’s Azzurri color scheme? 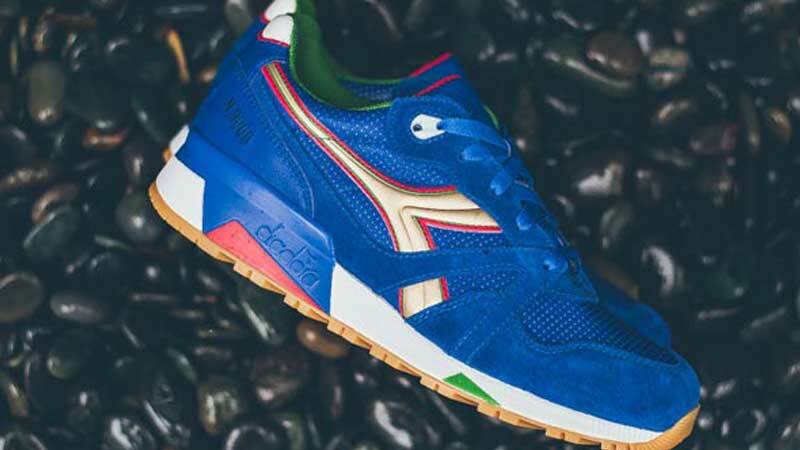 Well, the Diadora N9000 Azzurri color scheme is exactly that! 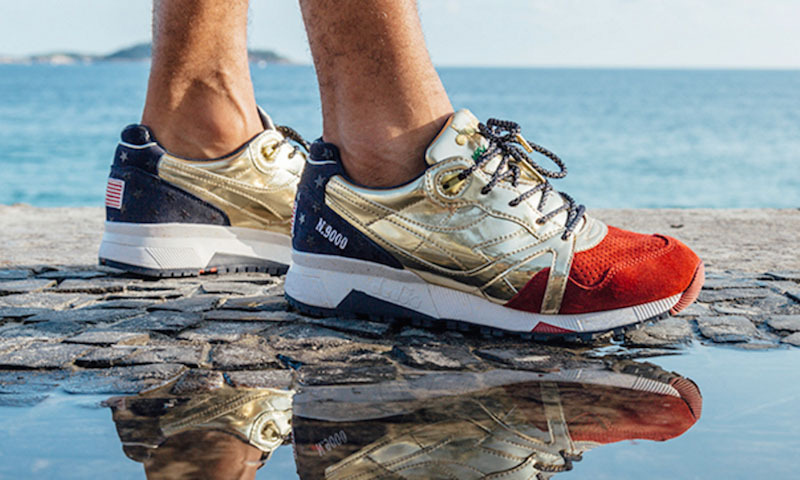 It has a predominantly royal blue upper, which carries a further touch of royalty in the form of gold brand running through the middle of the shoe and on the outsole. The red and green borders of the gold branding bestow a tinge of colors to the rich royalty in the color scheme. Sombra is Diadora’s response to other shoe makers launching their snake-versions. Its snake-stripes patterned laces enmeshed in black just above the silver, skin-like texture give the shoe a conspicuously snaky look. The golden color running through the silver background adds a touch of camouflage to the suede upper. 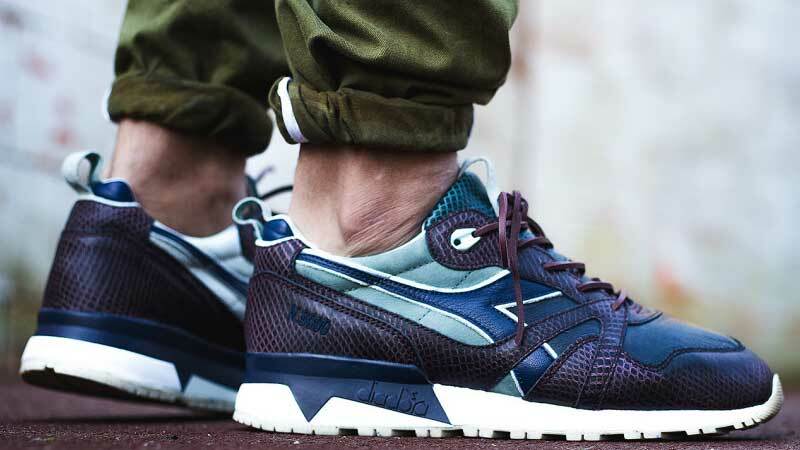 This marvel is the product of joint efforts by Diadora and 24 Kilates. 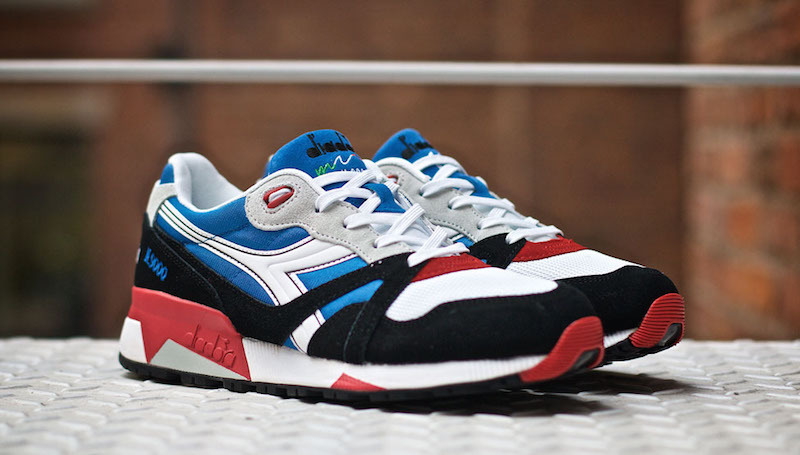 The Diadora N9000 Sol was another joint venture of 24 Kilates and Diadora. Inspired by the fall and winter in the Iberian Peninsula, the predominantly golden brown color scheme of the shoe is tinged with patches of mint green and different shades of grey to provide a complete color scheme reflecting weather change. 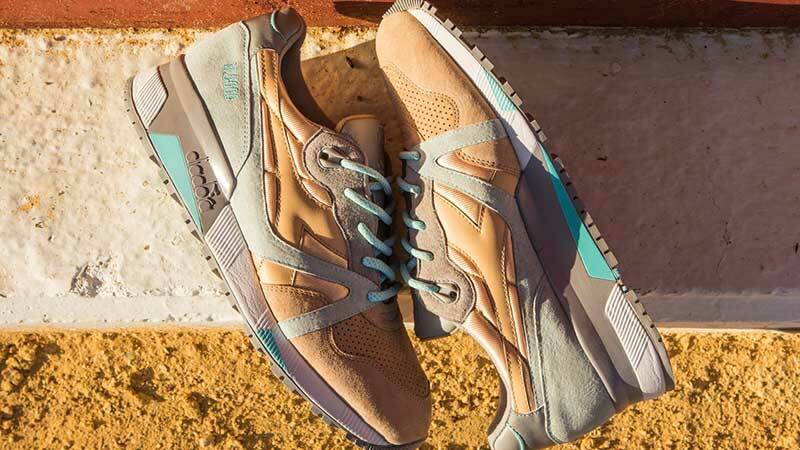 Inspired by Venetian Gondola, the Diadora N9000 Ferro is made of top-quality kangaroo leather with a rich color scheme that contains a light blue upper surrounded by grey suede panels at the front foot, quarter, and vamp. Even more distinguishing is how the Ferro combines so many shades of grey and black and neatly blends them with blue without letting, at any point, the color contrasts fall out of place. 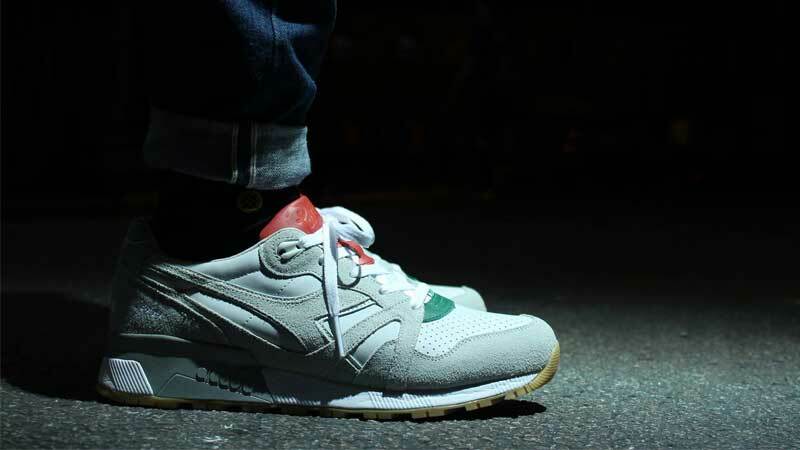 Italia came out of Diadora’s partnership with Patta, and it makes a point of it that everybody notices the marks of the high-end alliance in every part of the shoe. Predominantly made of pigskin suede, the Italia contains leather with accents of red and green to add colors to the sober white and grey color scheme. The Saturday Special is a universal favorite. Its burgundy leather, accents at the front foot and heal counter, and the sky blue toe box create a contrast that turns off no one. The burgundy meshes beautifully with the light blue on the front, red on the back, and white and grey outsole to make this child of Diadora and Hanon a favorite from Glasgow to Rome. Looking for something neat and clean? The White/Gum is your answer. 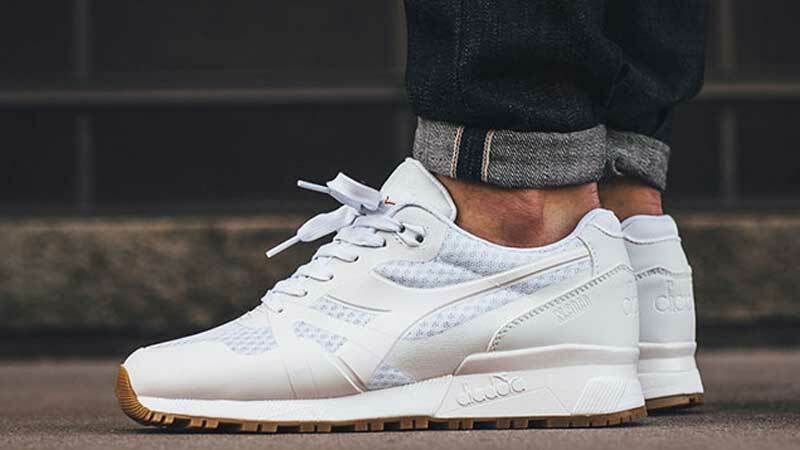 It’s Diadora’s version for people who don’t like all sorts of colors cluttering their shoes. Naturally therefore, the shoe’s color scheme is rather simple. Its predominantly white, taped lower, tonal laces, with brown under sole is meant to suit people who like to keep it neat, clean and simple! 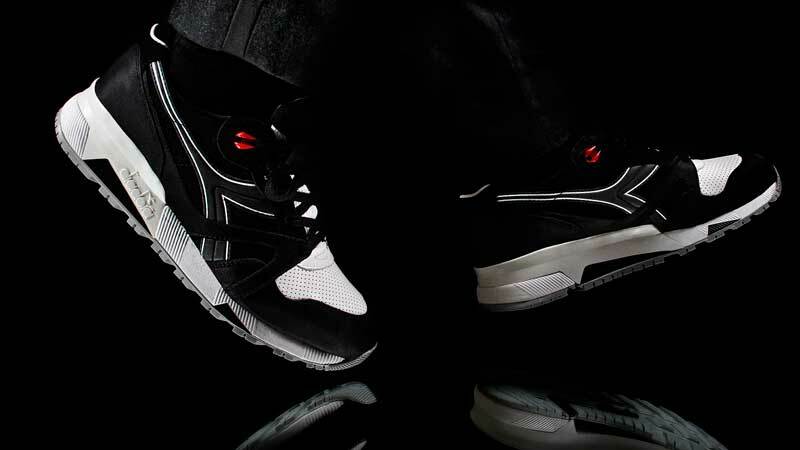 The Diadora N9000 Triple is the series’ only all-black model. 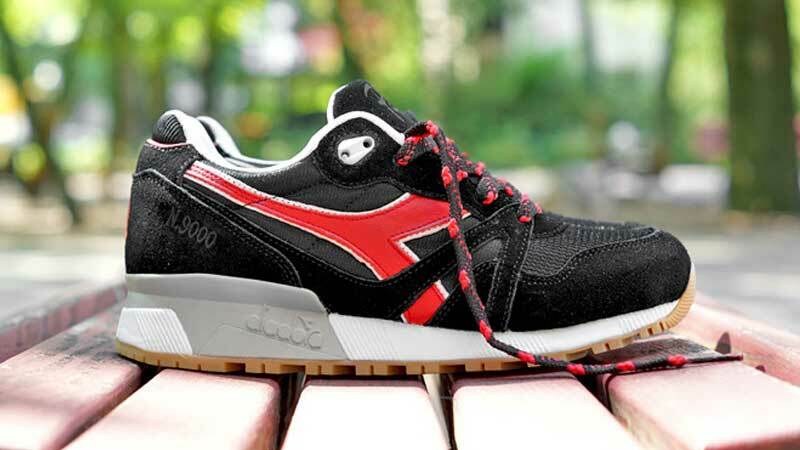 Diadora has designed it artfully and given it three shades of black—all having their corresponding match with a unique part of the shoe. The only exception to this all-black theme is the tongue, where you’ll find green, white and red embroidery reflecting the Italian flag’s color scheme. Remember Rawkwon’s “Purple Tape”? 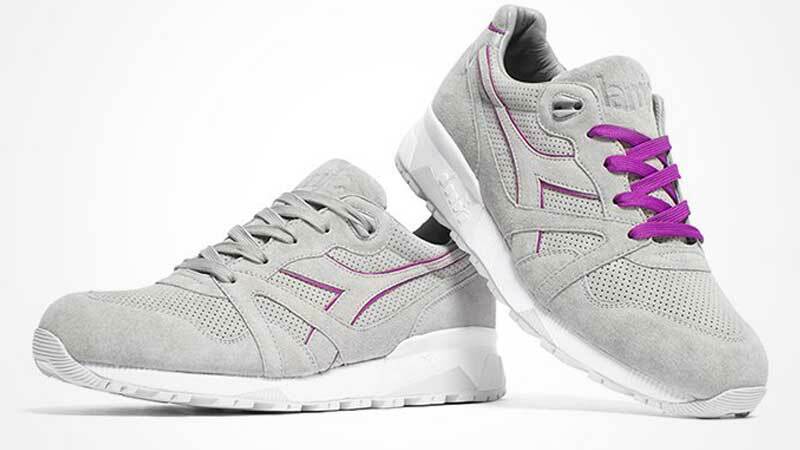 The Raekwon is Diadora and Packer’s effort to make sure that you do. The shoe’s purple mesh base is adorned by soft purple suede panels with 1995 embossed on the heels. On the tongue is an even catchier embossing that resembles a paper sticker reading “Raekwon”. 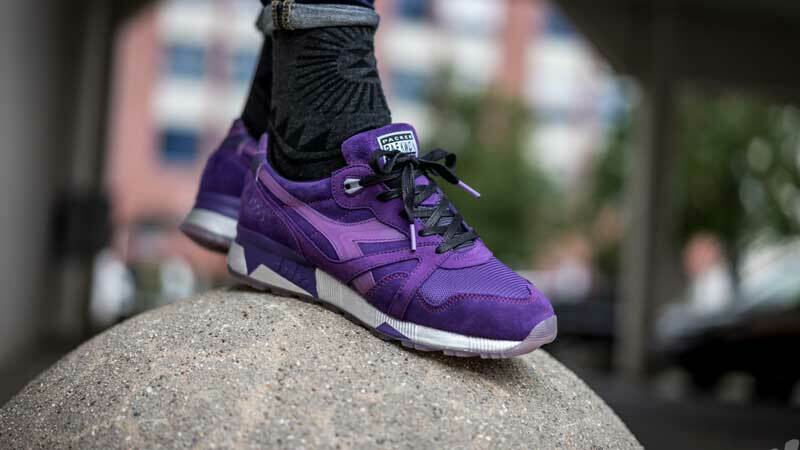 The white outsole and laces provide a superb contrast to the purple. 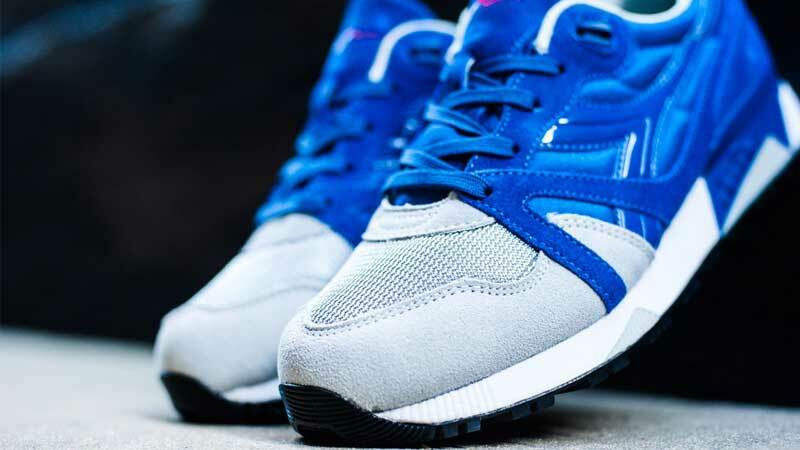 The Transit ii is the second product coming out of Diadora’s partnership with Hanon, and like the first one, it has been become one of the bestselling models of the N9000 range. 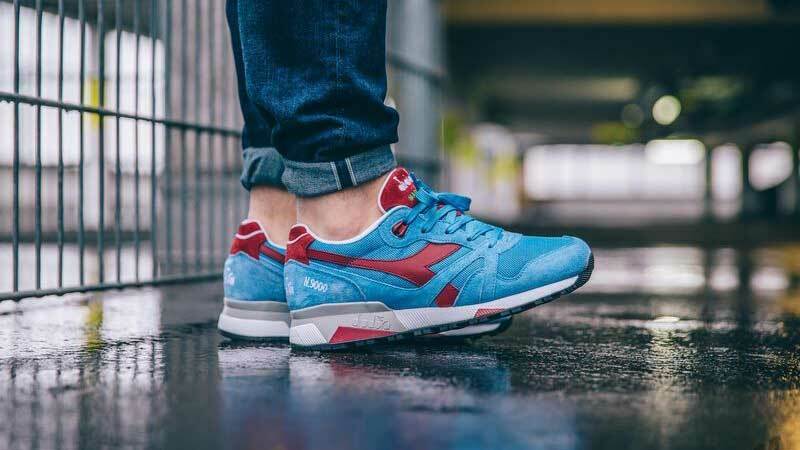 Made of pigskin suede and kangaroo leather, the Transit ii combines lush teal blue with patches of red and white to give it a rich color scheme that reflects the high sense of taste Hanon and Diadora stand out for. 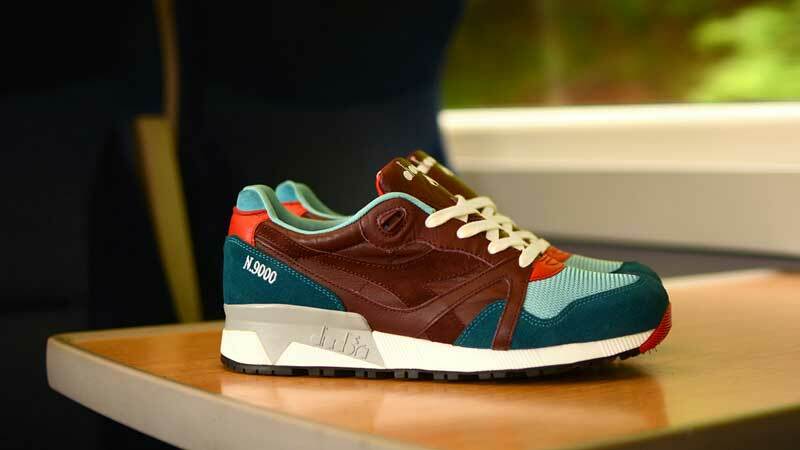 The Diadora N9000 9 was jointly created by Patta and Diadora to pay homage to AC Milan Strikers. Now, that’s something most Americans wouldn’t know anything about, so let’s skip to the color scheme of the model. 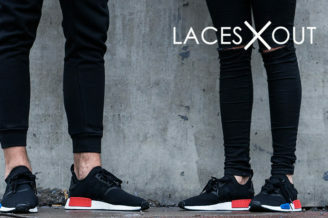 The shoe has a predominantly black outer with a streak of red running from the midsole to the heel. The tongue of the shoe is embossed with “Patta”. The white outsole with yellowish bottom makes the contrasting black all the more noticeable. What’s your favorite colorway? Leave it in the comments below! I like the golden straw/bermuda green combination. Great for weekends and can be worn with any clothes. Not a common color combo, it will surely be a standout! Saturday special is LIT! I like how the burgundy leather clashes with the sky blue toe box. Beautiful, bold, and definitely eye-catching. I’m sold! 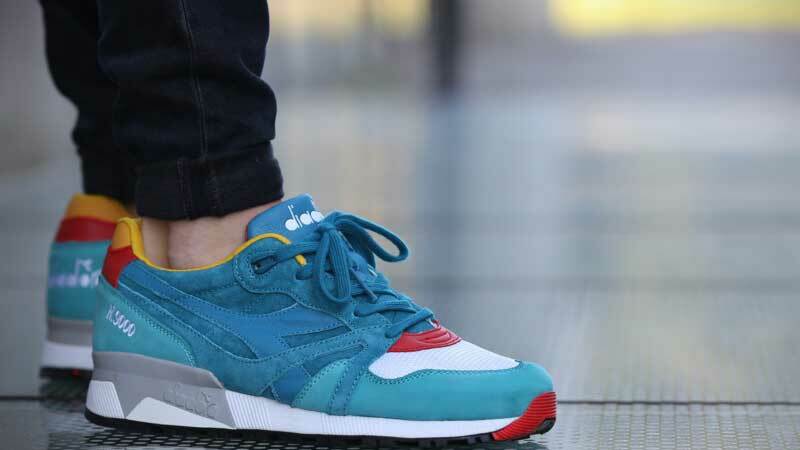 I always love how Diadora combine colors on their sneakers. My favorite colorways is N9000 Sol. Poppy Red is my favorite of all time. The color is so bright and cheerful. I love this collection! You can’t beat the Italians when it comes to designs and styles from chic clothes to cool footwear. 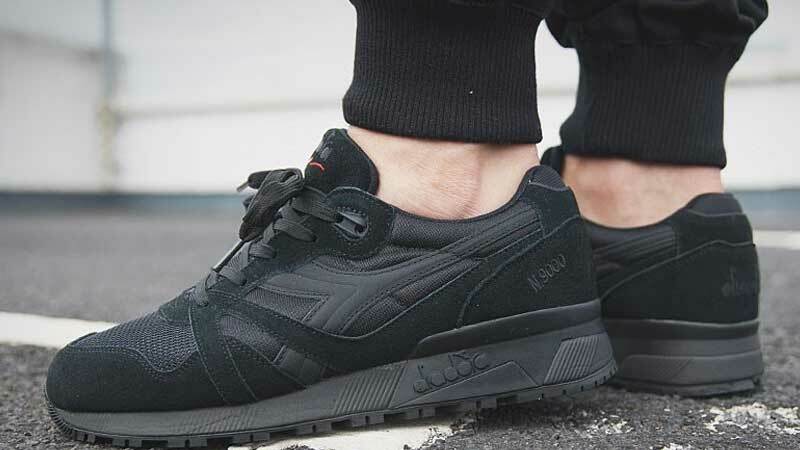 Diadora N9000 NYL tripple black looks good. I can’t wait to try them out!! I like the La MJC – white with just a hint of color. It would go well with any outfit and occasion. I don’t like a whole lot of color, just enough to be flirty! I like the pastel colours of Lire. 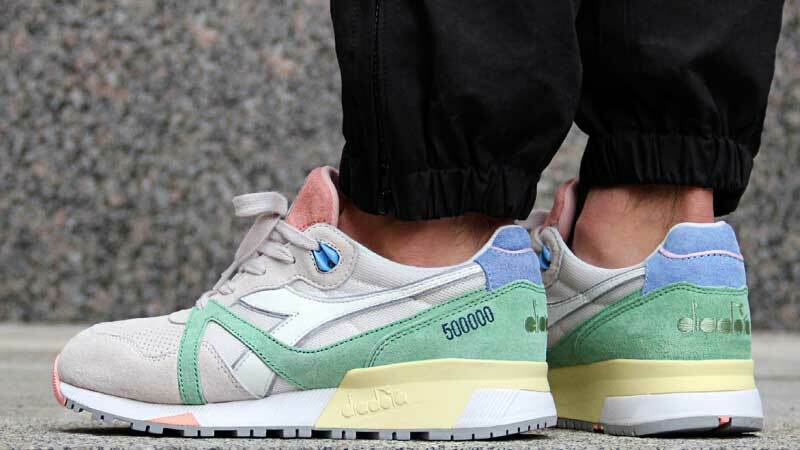 I haven’t had any Diadora shoes, but if I’m gonna buy one, it’s gonna be Lire! I like the earth tones of Sombra. Not a big fan of suede, but I’m definitely gonna cop this beauty. That “snake” lace is a nice touch too! I like the poppy red ones best. They’re really bright and cheerful. The “La MJC” would look great on my girl. Personally, I’d go for the “Black Tie”. The “French Blue” would be perfect for Megaman X. 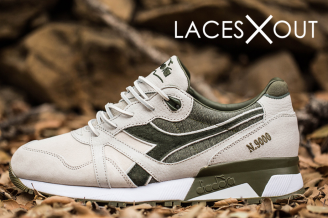 “Diadora teamed up with Social Status to create 2 new colorways for the N9000s. This pack is in honor of the upcoming Summer Olympics in Brazil.” What I think that, this pack is in honor Summer Olympics, it shows that, the the running and sporty shoes for the spirit of Olympics. I like the “Saturday Special” and the “Black Tie.” To me, they have the boldest looks of the bunch. I’d be curious to see how the Diadoras compete against the Air Jordans. I think the Diadoras are more dynamic.